A Turkish court on Monday released a housewife, a mother of five whose children were abandoned in a parking lot after her detention, on TL 50,000 bail. Local journalist Gökhan Özbek reported the release of the woman, named Nagehan, who had been arrested on charges of terrorism after a visit to her husband, currently jailed over alleged links to the Gülen movement. Özbek tweeted that the mother was released after the court banned her from travelling abroad and set bail in the amount of TL 50,000, a high figure in a country where the minimum wage is approximately TL 1,300. The woman will be put behind bars again if she fails to pay the bail within seven days. After the story broke, journalist Mahir Zeynalov, deported from Turkey due to critical tweet in February 2014, launched a fundraising for the five siblings who were left in the parking lot and raised $42,260. 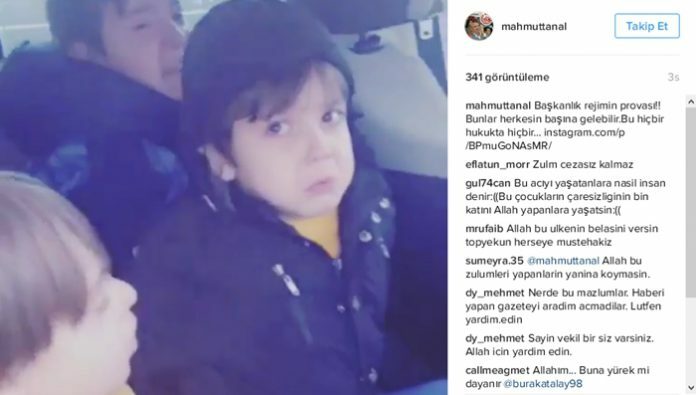 A video shared last week on social media showed five children left alone in tears in front of Sincan Prison in Ankara after their mother was detained while they were visiting their father in prison. “Leaving children alone in such a situation is against the Convention on the Rights of the Child and all related laws. We will follow this issue,” said Mahmut Tanal, a deputy from the Republican People’s Party (CHP) and a member of the Human Rights Commission in the Turkish Parliament, on Monday. Reaction mounted after the video was shared on social media by Tanal. People say similar incidents have occurred since a witch-hunt was launched against the Gülen movement by President Recep Tayyip Erdoğan and the ruling Justice and Development Party (AK Party) following a failed coup attempt on July 15. This article originally appeared in Turkish Minute on Jan. 31.